Slack just got a new design with a much more purple sidebar in an update. Here’s how to change Slack’s sidebar colors back to the classic theme you’re familiar with, or pick any other color scheme. Select the “Sidebar” option on Slack’s preferences screen. 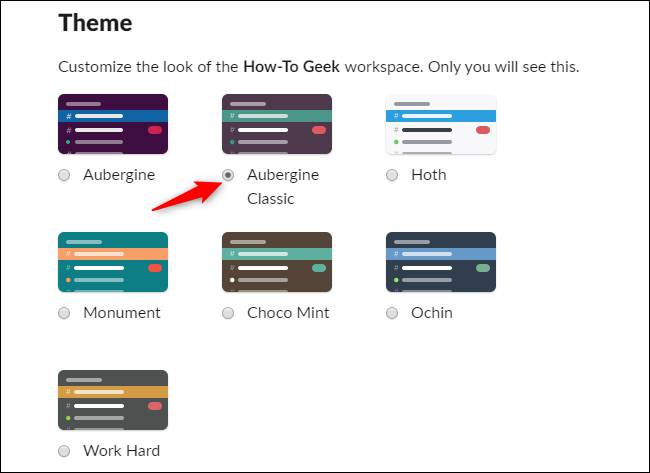 Slack’s new default theme is Aubergine, and you were automatically switched to it if you were using Slack’s original theme. Select “Aubergine Classic” to go back to the classic colors. You can also select any of Slack’s other built-in themes here. Any theme you choose will only be seen by you, and everyone else in the Slack workspace can choose their own preferred theme. If you don’t like any of these themes, you can choose a user-created theme—or even make your own! Just click the “Customize your theme and share it with others” link at the bottom of the theme list. You can select custom colors for Slack’s theme here. You can find user-created themes on websites like slackthemes.net. Just copy-and-paste the values from the theme website into the Custom Theme box on your Slack preferences screen. For example, here’s a nice-looking Tron theme if you’d like a dark black sidebar with blue highlights. Just copy the theme code from the website and paste it straight into the box on Slack’s preferences screen. Your changes will instantly take effect. Want to share a cool theme you found or created with other people in Slack? That’s easy, too. Just paste the code into a Slack message and send it. Other people in Slack will see a “Switch Sidebar Theme” button they can click to quickly switch to your shared theme. The theme you choose will follow your Slack account across devices, so you’ll see your chosen Slack theme on all your PCs, Macs, Chromebooks, iPads—and even your phone.